Hotel Gangtarang proudly stands overlooking the mighty Ganga River and the temple yards of Hardwar. The feel cannot be matched by anything but stay at Hotel Gang Tarang. Complete with all the modern amenities to suit your traveling needs, the location also makes every other corner of the city accessible. 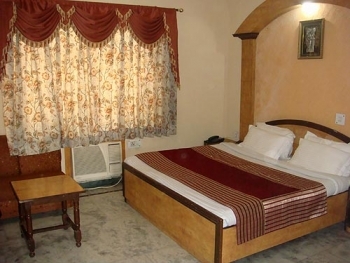 Hotel Gangtarang is located on Main Delhi Haridwar Road (Near Singh Dwar). Hotel is just 2.5 kms from Har-Ki Pairi, Railway Station 1.5 km, Haridwar Bus Stand is 1.5 km, Jolly Grant Airport is 35 km from hotel and just 20 minutes drive from Rishikesh. Hotel Gangtarang is a newly built hotel and all 15 rooms are beautifully furnished A/C rooms feature comfortable beds and the most spacious floor plans. Hotel Gangtarang in Haridwar is maintained with spacious guestrooms which offer the serene view of the River Ganga. Hotel offers air-conditioned rooms with each one of the decorated with the most modern of luxuries that are expected from a hotel of this class. 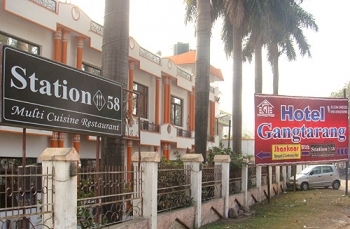 Authentic Indian and Continental food is served at the Station 58 Restaurant in Hotel Gangtarang. There is also Banquet hall named - Jhankaar and a business center are available along with Internet facility for a winning conference event. Hotel Ganagtarang is situated on main Delhi-Hardwar Road at Singh Dwar, Haridwar, which provides several advantages to the travelers. While it is very close to government offices, BHEL / SIDCUL, Har-ki-Pauri, Mansa Devi temple and other places of tourist interests. By Air: The nearest airport to Haridwar is located in Dehradun called the Jolly Grant airport, which is about 35 km away from the city. From Dehradun you can either board a train or hit the road to reach Haridwar. Also one can take a flight to the International Airport at Delhi and from here one can take a train or road journey to the holy city. Jolly Grant airport is presently undergoing renovation and therefore closed for flights. By Rail : The Indian Railways has a railway station at Haridwar which is connected by trains from major cities of India. Reaching Haridwar by train is one of the most convenient and economical means. Trains from Ujjain, Delhi, Varanasi, Bombay, Allahabad, Amritsar, Lucknow and Dehradun all ply regularly to Haridwar. By Road : Many inter-state deluxe, semi-deluxe and ordinary buses ply to Haridwar everyday. If you wish to come in a large group you can even book a private bus for coming to Haridwar. For a smaller group private cabs or even your own vehicle can be used to reach Haridwar. In the course of the journey you will find several restaurants, hotels, motels and even garages for servicing of the vehicle.